Camille Arbogast and Jesus MacLean work and live at the Devotion House as curators and caretakers. They help with the Society's programs and publications, care for its collection, and are tour guides for the Devotion house. Camille is a museum professional who works for Historic New England and the Trustees of the Reservations. She has worked for Gore Place in Waltham, the Newton Historical Society, and as an American History teacher for Newton Community Development Foundation. She wrote and leads walking tours of the old Norumbega Amusement park in Newton. Her current research topics include the Codman family and Colonial era Indentured Servants in Concord. Jesus, who was raised in Brookline, currently works for the Boston University library system. In addition to his interest in architectural history, he is dedicated to the field of library and information science. Previously, he worked for Historic New England, at the 1938 Walter Gropius House in Lincoln. Patrick Farmer and Meredith Ruhl are the caretakers of the Widow Harris House and the Putterham School at Larz Anderson Park. 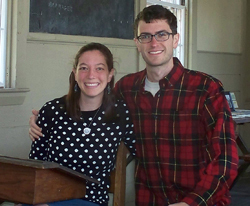 Patrick and Meredith moved into the 18th century Widow Harris House in August 2014. They present tours of the Putterham School and help out with other activities of the Society. Patrick is a 7th grade teacher at the Shady Hill School in Cambridge. He previously spent seven years working with children as a farmer-teacher at The Farm School in Athol. Meredith works in the children’s department of the Marlborough Public Library and is earning a master’s degree in library and information science at Simmons College. She previously worked as an instructor at the Natick Community Organic Farm.